. daija, orochi 大蛇 huge serpent, great snake . 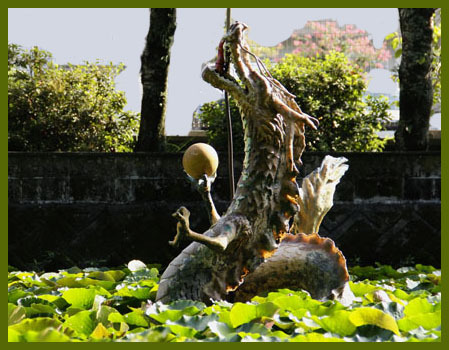 There are many legends about the "Master of the Pond", who is a messenger of the kami　神　Deity of the Pond. It can be a dragon or huge serpent, a turtle or a catfish or any other animal that lives in the water. One common theme is the master of the pond providing trays and bowls 膳椀 for the village festivals.
. zenwan 膳椀 trays and bowls for village festivals . A popular "ike no nushi" is a huge serpent. A huge snake demon monster. 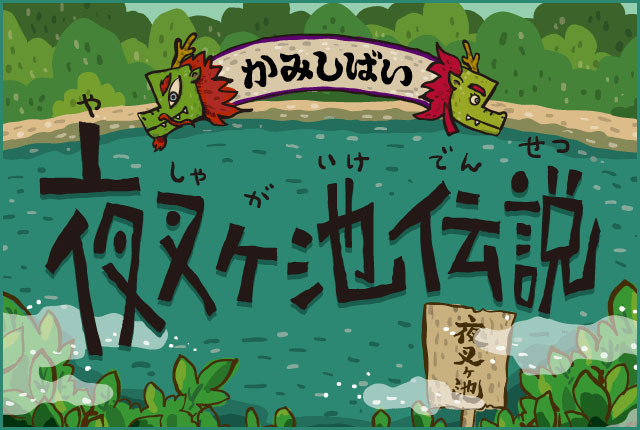 He / she impersonates the ike no nushi 池の主 Master of the Pond and usually asks for human sacrifices. 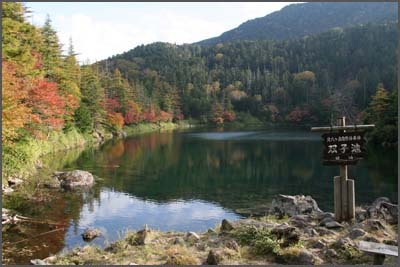 In Shiga, Gifu and Fukui there are legends that a young monk had been bewitched by the Master of the pond. This is also the title of a Kabuki play and a famous movie from 1979.
. Yashagaike legend and Yasha Hime 夜叉姫 festival .
. The Kappa from Genpachinuma swamp . At the foot of the 西山 Western Mountain there used to be a huge pond. The master of the pond provided trays and bowls 膳椀 for the village festivals. They put a paper with the name of persons at the edge of the pond and on the next day, the food trays were delivered. To thank the Master of the Pond they poured some home-made doburoku どぶろく sake in the pond. 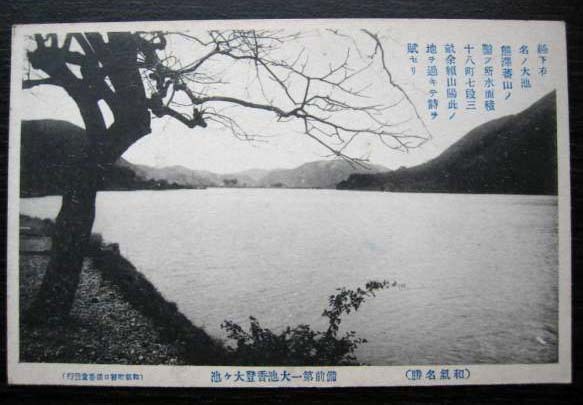 佐久穂町 Sakuho - Futago-Ike 双子池 "The Twin Ponds"
This legend is about the 雄池 "Male Pond" . Once upon a time in the village of Kirihara 切原村 there was a beautiful young girl, but she became depressed and introverted and one day run away from home. A friend told her mother that she had always told her she wanted to become the Master of the Pond Futago-Ike. So her family went to the pond and what do you say, at the bottom of the clear pond they could see the traces of a snake having crawled along. Since that time villagers knew that this pond had a master and dared not swim in there any more or throw stones into it, lest the Master would get angry and heavy rain would fall. 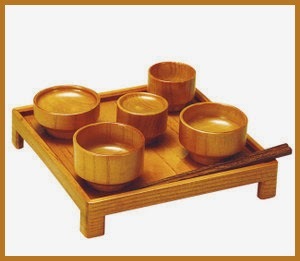 The master of the pond provided trays and bowls 膳椀 for the villagers when they had visitors. Once a villager had broken a bowlbut just brought them back without an apology. From that day on the Master did not lend them any more. The Masters of the pond Nonomi no Ike 野々見の池 and Ikejiri no Ike 池尻の池 had a fight. The Master of Ikejiri lost and its water was drained off to make space for new fields. The 滝 Dragon at the Sanctuary for 不動様 Fudo Myo-O at Ikejiri was at the outlet of the pond water and there have always been three or four pots with water, where the Master of the Pond could now enjoy his stay. At the festival for Daimyojin 大明神祭 people pray for a good harvest and safety for the family. There is also a waterfall for Fudo, 池尻不動滝 Ikejiri Fudo Taki.
. 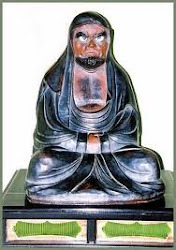 Legends about Fudo Myo-O お不動さま . Once the lord of the domain was 日置孫一郎 Heke Magoichiro (Heki Magoichiro), hence the name of the pond. Later the region came under the clan of Ikeda 池田. One of the senior retainers of Lord Ikeda was named 日置 Heke and to honor this man the writing of the name of this pond changed from 日置池 to ヘケ池. The pond was quite large and never dried out during a drought, but then Lord Ikeda gave order to dry it out and turn it into fields. When the water was almost drained off the pond, a huge catfish なまず became visible. The villagers realized that this was the Master of the Pond and they had to save it. They decided to bring it to the inlay of 片上湾, put the catfish into a huge wooden barrel and four strong men began to carry it toward the coast. "I am ヘケ太郎 Heketaro from the Heke pond. Hey, 大が三郎 Ogasaburo, are you there?" Ogasaburo was an old friend of his and when he answered, Heketaro jumped out of the barrel and into the pond to live there.
. namazu 鯰 catfish ( Silurus asotus) - Wels .
. Amulets with the Daija　大蛇のお守り　.
. Join the MINGEI group on facebook ! . The master of 明かずの池 Akazu no Ike was a huge serpent.
. Legends about ike no nushi 池の主 と伝説 the Master of the Pond .
. aka-ushi 赤牛 the red bull / red cow . The red bull had to flee from the pond and escaped to another one, the pond in Jigokudani.